I'm not really one for keeping a diary, but I do have a little journal that I use to keep all my sewing ideas. It has everything from my wishlist of patterns to buy, to fabric combos I like, sketches for clothes I want to make, my always growing 'to do' list and lots of little inspiring pictures ripped from magazines. I also have a huge stack of fabric from the Echino Fall 2010 collection that I just adore, and look at at least once a day. I've been wanting to make something for me out of the fabric, but wasn't really sure what. I'd like to reupholster a chair, but haven't found the perfect chair yet, and I haven't yet found the 'perfect' bag pattern to suit the fabric, so a handbag is out for now too. 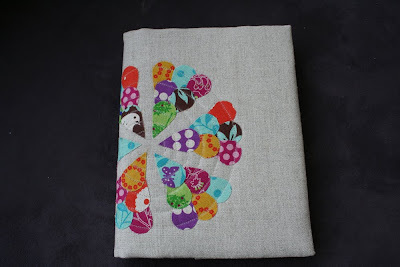 I eventually decided on using some of the Echino to make a cover for my sewing journal. It's only a small journal (A5) so completely covering it in Echino seemed way too busy. 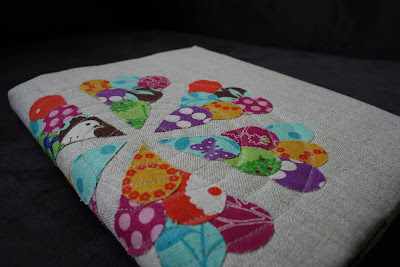 Then I remembered these gorgeous cushions I saw on Flickr and used those as inspiration. 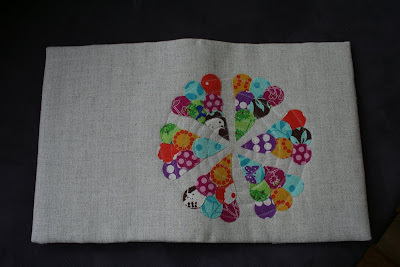 I made a template then cut small petals from the fabric and fused it to some lovely soft linen from Kelani Fabric. I then backed the linen with pellon and quilted the petals with a big spiral, before sewing it into a journal cover. I'm chuffed with the results and am thrilled to have something just for me, especially as I can get my fix of Echino every time I use my journal. All done! If I had my time over I would have used a lighter-weight pellon. You can still see my chalk quilt markings too - need to give it a good dust-off. Sigh - I love Echino. The pattern wraps over the spine and around the back of the journal. No ,not a nerd at all! Claire - this is so lovely - think I may need to copy you! My 'sewing book' is a rather cheap and nasty thing from Woolies!! This is beautiful! I love it. I love Echino too although i don't have any in my stash yet. What a great way to use it.